One of the projects I worked on this past year was the Mobile Technology for Community Health MoTeCH : suite of services delivered over basic mobile phones that provides relevant health information to pregnant women and encourages them to seek antenatal care from local facilities. So i am always interested when i find data on use of the mobile phone in relation to health . … So I have just being reading on the Mobile phone kits to diagnose STDs in the UKwhere People who suspect they have been infected will be able to put urine or saliva on to a computer chip about the size of a USB chip, plug it into their phone or computer and receive a diagnosis within minutes, telling them which, if any, sexually transmitted infection (STI) they have. I thought about how in Ghana West Africa could possibly borrow the concept but adapt it to our environment . 3.Based on their answers to those questions further questions be asked . 4.A provisional diagnosis be given to the user at the end of QA session and then they can be directed to nearest health post . 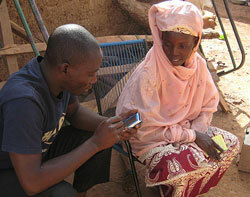 Achieves the same purpose: it gets people to health centers to seek medical care . Anyone doing this in the African/west African region ? I think Google SMS health tips did a part of this in Uganda. There may be plans to bring this to Ghana also, but I’m not sure. It provides sexual and reproductive health tips using free-text querying via SMS as well as a clinic finder.